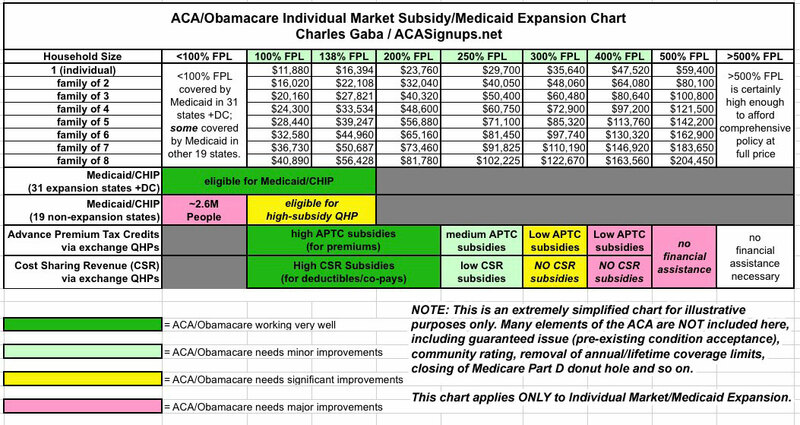 Home » Blogs » Charles Gaba's blog » UPDATE: GOP's #BasementBill tax credits average 36% LESS than the ACA. More specifically, the ACA tax credit for an eligible individual is the difference between a specified percentage of his or her income (Table 1) and the premium of the second-lowest-cost silver plan (referred to as the benchmark premium) available in the area in which they live. There is no tax credit available if the benchmark premium is less than the specified percentage of premium (which can occur for younger purchasers with relatively higher incomes) or if family income falls outside of the 100% to 400% of poverty range. For families, the premiums for family members are added together (including up to 3 children) and compared to specified income percentages. ACA tax credits are made available in advance, based on income information provided to the marketplace, and reconciled based on actual income when a person files income taxes the following. Because of the "...benchmark is less than the percentage" caveat, just being within 100-400% FPL doesn't guarantee that you'll receive a tax credit, and there are other exceptions, but the 100-400 range is a fairly good rule of thumb. ...or something along those lines. While I'm at it, I'd also expand/revamp the Cost Sharing Revenue structure as well; right now CSR only applies to those below 250% FPL, and is only strong for those below 200%. Furthermore, from a sheer public awareness POV, that cut-off confuses the hell out of people. I'd also have CSR apply to everyone below 500% FPL, tapering off as you move up the income ladder. The House Discussion Draft and Price bill take a simpler approach and specify the actual dollar amounts for a new refundable tax credit that could be used to purchase individual market coverage. The amounts vary only with age. In the House Discussion Draft, tax credits range from $2,000 for people under age 30, to $2,500 for people ages 30 to 39, $3,000 for people age 40 to 49, $3,500 for people age 50 to 59, and $4,000 for people age 60 and over starting in 2020. In the Price bill, tax credit amounts in 2017 range from $900 for people under age 18 to $3,000 for people age 50 and over, which we estimate would increase by 2020 to range from $900 to $3,150. The tax credits in both of these replacement plans would be available to people of all incomes who purchase individual market coverage. We estimate – based on the age distribution of marketplace enrollees – that current enrollees would receive an average tax credit under the House Discussion Draft of $2,957 in 2020, or 36% less than under the ACA, and under the Price bill would receive and average of $2,256 in 2020, or 51% less than under the ACA (see Table 3 and Figure 3). While many people would receive lower tax credits under the Price bill and House Discussion Draft, some would receive more assistance, notably the 19% of current marketplace enrollees who do not qualify for ACA subsidies. In other words, remember this (admittedly crude) table I whipped up a while back? Notice that it basically reverses the color pattern: Instead of helping the lowest-income the most, it helps them the least relative to their situation and needs. If you're poor and older, you get double-screwed. However, one significant change to the tax credit is being considered: not allowing wealthier Americans to qualify for assistance. No specific proposal for cutting off eligibility has been added to the legislation, but staff have been directed to come up with possible proposals, according to a source familiar with the deliberations. In other words, at least some of the green sections above would presumably change to light green...except there's no specific cut-off income included yet. This change would also mean that you'd still have to provide proof/verification of your income...which wipes out any claims of "streamlining/simplifying" the enrollment process. That is, you'd still presumably have to fill out the exchange website application. Let's assume, for sake of argument, that the "means testing" change would mean that those making over, say, $200,000 don't receive a tax credit. Only around 2-3% of all Americans earn that much, and presumably a large chunk of those are covered via their employer or are over 65 and on Medicare anyway, so this isn't going to save much money for the federal government. What we're really talking about here is neutralizing ads attacking the GOP for giving Bill Gates $4,000 he doesn't need while only giving some minimum-wage shlub $2,000 that he does. Granted, Bill Gates himself presuambly wouldn't actually receive the GOP tax credits, since I assume he's still insured through Microsoft...but he did retire as CEO quite some time ago, so I'm not sure what his legal "employment" status is, so perhaps he would. Either way, "Non-elderly self-employed billionaires!!" doesn't have quite the same rhetorical sting to it as naming a specific person. The latest draft, dated Feb. 24, also still includes a plan to phase out Obamacare’s Medicaid expansion. Instead the program’s current open-ended federal entitlement would be replaced by capped payments to states based on the number of Medicaid enrollees. I believe this means that Block Grants are still included. Oh, and 14 million people would still be kicked off of Medicaid. The proposal also still includes plans to eliminate Obamacare’s taxes. Revenue would be generated by capping the tax exemption for employer-sponsored plans at the 90th percentile of current premiums. That means benefits above that level would be taxed. I think this means that if your employer-provided healthcare policy costs $10,000/year at full price, you'll be taxed on $1,000 of it...$250/year, assuming you're in the 25% tax bracket. Perhaps the biggest change in the latest draft is removing a section that would have allowed “grandmothered” plans to remain in the market indefinitely. Those are plans that were in existence when Obamacare was fully implemented in 2013, but that didn’t meet the coverage requirements of the law. This would be a major change...if the GOP's plan still required healthcare policies to maintain the same minimum level of Essential Health Benefits that ACA-compliant policies do. Since to my knowledge the GOP plan strips away those requirements anyway, however, I'm not sure that this means much in practice. The latest version of the bill creates a default “reinsurance” fund for states that fail to take advantage of the grants, which is similar to a program in the Affordable Care Act. Under the new proposal, insurers would be reimbursed for expensive customers with medical claims that exceed $50,000, with a cutoff point of $350,000. I'm not an expert on reinsurance, but this sounds like pretty weak tea to me. To my knowledge, the real risk pool problems are enrollees who rack up claims into the million-dollar range, so I'm not sure how much this would help. In short, these latest changes would still do absolutely nothing to make the GOP's bill any better for lower-income people, while it would still be a huge windfall for the wealthy. It would slightly improve the situation for the insurance carriers (though I suspect they'd still prefer to simply have the $10 billion or so in Risk Corridor reimbursement that they're already legally owed under the ACA which was denied them by Marco Rubio & Co. a couple years back, along with a guarantee of the CSR reimbursements which, again, they're legally owed on an ongoing basis). It's still a big piece of crap, with a few sugar sprinkles on top.